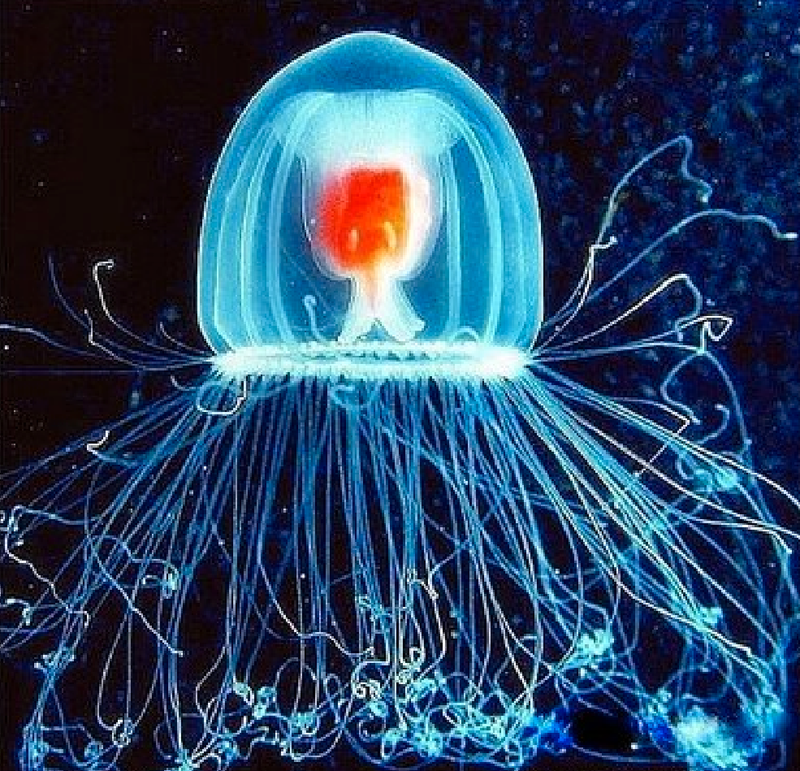 Prompt: The Immortal Jellyfish – Wilson K.
Turritopsis nutricula, the immortal jellyfish, is a hydrozoan whose medusa, or jellyfish, form can revert to the polyp stage after becoming sexually mature. It is the only known case of a metazoan capable of reverting completely to a sexually immature, colonial stage after having reached sexual maturity as a solitary stage. Some amazing science-fiction stuff here for you to build around. You could either go with the unkillable monsters rising from from the ocean, or you could go for the genetically spliced Jellyfish hybrids that escaped from a government facility somewhere off the coast of Bermuda. Personally, I’ll go for the deadly Sushi dinner in Tokyo that went from bait to mate. Kari Katsudon is your typical Japanese salaryman. Everyday, he works long brutal hours in the confines of a tiny office, churning out dozens of boring reports for the electronics division of the Keiretsu he is working for. By night however, he lets his hair down and becomes quite the party animal, spending his evenings merry-making with his colleagues at the various Izakayas scattered around the Shinjuku district of Tokyo, often till the wee hours of the morning before stumbling home drunk. One day, his colleague, Unbutu Hori, suggested that they try out a a new Izakaya that he had chanced upon while walking home one night. “They had these colourful looking jellyfish sitting in giant tanks outside the shop. They must taste good if they’re served fresh from the tank,” and everyone agreed. So at the stroke of 8pm, the salarymen and office ladies gathered at the lobby of their building, and squeezed their way onto the train headed Shinjuku station. It was only a short journey, and when the train reached its destination, hordes of weary office employees spilled out onto the platform. Shinjuku was the unofficial nightlife capital of Tokyo. “This way.” Hori shouted cheerfully above the din in the station, ushering his party of friends to their dinner destination. And soon, Kari could see them. The colourful jellyfishes, sitting in giant tanks, just like Unbutu said. Kari was excited, he loved the tasty, chewy texture of jellyfish, but never had chance to try one so fresh before. “I’ll have that,” he said to the waiter, pointing to a translucent looking jellyfish sitting alone in the topmost tank. It was a beautiful specimen, one of the best that Kari had ever seen. He can’t wait to get a taste of those chewy fibrous tentacles dipped in vinegar. “Hai, so sorry, but this jellyfish is very special. Very expensive too.” He flashed a figure with his hand and Kari almost choked at the price. “Hai, so sorry, please choose another one.” But the more Kari looked at that particular jellyfish, the more his heart told him to go for it. His tastebuds were aching just for a taste of it. It’s soft glowly skin must have the most wonderful of textures, he thought. And that mass of pulsating flesh at its centre, he knew that would be the sweetest piece of raw seafood he would ever taste in his life. He must have it! End of Part 1. This story went a lot longer than I thought. Part 2 coming tomorrow! Just a fun story, please don’t mind the stereotypical characters. Where I’m from, Jellyfish is served pretty commonly in restaurants and banquets as a cold appetiser. It’s pretty tasty actually, try it! This entry was posted in Story Prompts and tagged Fiction, Idea, Japan, Jellyfish, Prompt, Sashimi, Science, Science Fiction, Sea, Story, Sushi, Tokyo, Weird, Writing. Bookmark the permalink.